For his internationally inspired menu, Chef Rob Connoley sources his meat from the local 4-H and forages 40 percent of his ingredients in the summer. 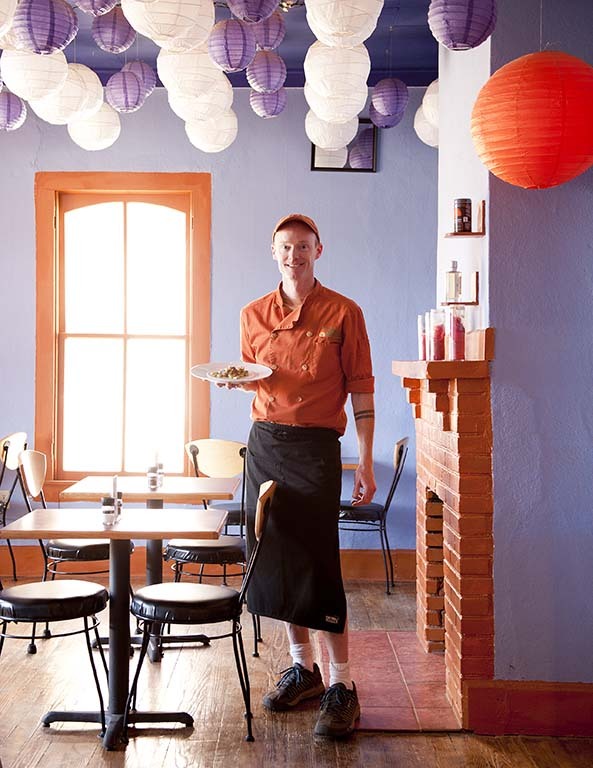 Deep in the New Mexican desert, a dusty four-hour drive from Albuquerque, Rob Connoley riffs on global dishes like Doro Wat, an Ethiopian chicken stew, and the Vietnamese noodle soup, pho. He forages for acorns that he turns into financiers and uses hydrocolloids to create caviar-sized balloons of flavors like elderflower and pomegranate. 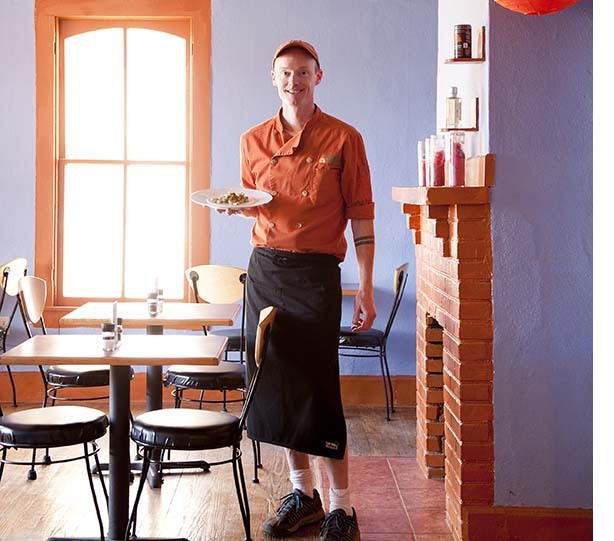 His restaurant, the Curious Kumquat, has put the tiny town of Silver City, New Mexico, on foodie bucket lists alongside destinations like San Sebastián, Copenhagen and Chicago. Connoley, a lanky blue-eyed man of 47, never set out to be a famous chef or even to own a restaurant. But when he moved to Silver City 12 years ago to take a job in nonprofit management, he refused to live in a food wasteland. “My partner, Tyler, and I started to ask locals what they thought the town needed,” recalls Connoley. The resounding consensus was good food. In 2004 Connoley opened a small grocery store stocking the flavors he’d come to love from Peru, Korea, Mexico and other far-flung places he’d traveled. “It was the pantry I needed to cook the food I wanted to eat at home,” he says. There was a section just for fish sauces and Indian spices, 100 varieties of chocolate bars, 75 types of cheeses and $200 balsamic vinegars. Suddenly, the 10,000 residents of this former mining town went from shopping at the Trader Joe’s (a three-hour drive away) to buying ingredients they’d never heard of at a gourmet food store that wouldn’t be out of place in Manhattan. The first day the store opened there was a line out the door. “People were truly starving for these flavors,” he says. Connoley started hosting 24-course experimental dinners at a friend’s house, for $35 a head. The dinners were a hit and inspired him to start serving lunch at the store and eventually dinner a few nights a week so he could play with modernist techniques. In 2012 he closed the grocery store so he could focus all of his energy on cooking. 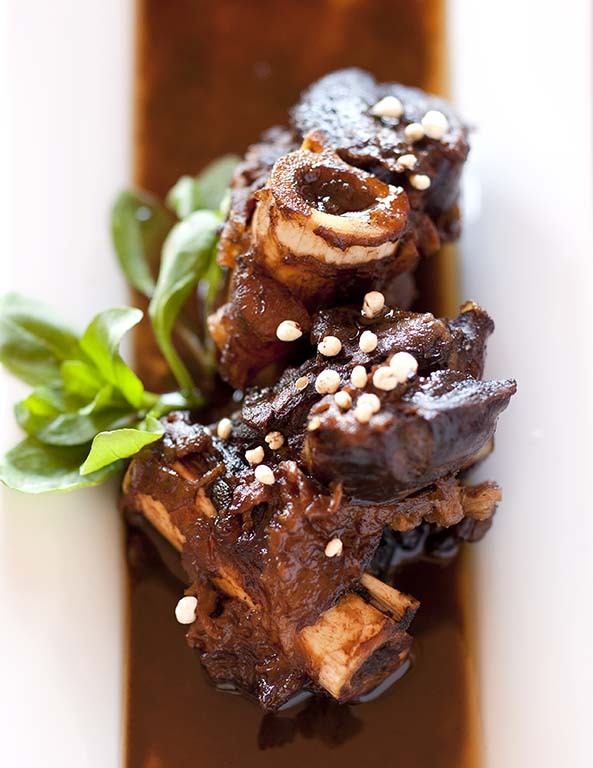 Curious Kumquat’s elk osso bucco with foraged watercress and foraged puffed amaranth. He forced himself to cook his way through Desserts by Pierre Hermé and learned, from a local mountain man, to forage acorns, cattails and other wild edibles. He built a greenhouse where he could grow fresh vegetables and forged relationships with local producers such as Frisco Farm and kids in the local 4-H Club who now sell him meat. The Quat, as locals warmly refer to it, is located in a quirky 1870s house. The front patio is set amid the restaurant’s garden beds and looks down Bullard Street, Silver City’s main drag. Inside, wild sunflowers, cattails and other foraged finds dangle from the ceilings of the various dining rooms. A small kitchen serves as the stage for Connoley’s one-man act. “My team is my left and right hand,” he jokes. “I prep. I cook and plate the food. I wash the dishes.” Lunch is meant to be fast, fresh and affordable, featuring familiar flavors. “I wanted this to be a place locals could eat at a few times a week,” he says. Connoley grinds local lamb for his hit gyro sandwich, and his green-chile corn chowder and cayenne-spiked peanut butter cookies have become lunch staples. Dinner is more of a special occasion affair for locals and a bragging rights experience for out-of-town foodies. Connoley lets his imagination run wild, fusing modernist cooking techniques with foraged ingredients and global flavors for his five-plus-course menus. Crawfish-filled samosas topped with pistachio foam take inspiration from the flavors of India as well as the nearby Gila River, where he gets his crawfish. Today he’s foraged bags of acorns on his morning hike in the Gila Mountains and has crushed them into flour to make acorn croquettes topped with Thai curry. The most groundbreaking restaurants are often short-lived. They open, shift our perception of what food can be and though they close their doors, their flavors and techniques are never forgotten. Late last year, Connoley announced his plans to close the Curious Kumquat in September because his partner needs to relocate for work. 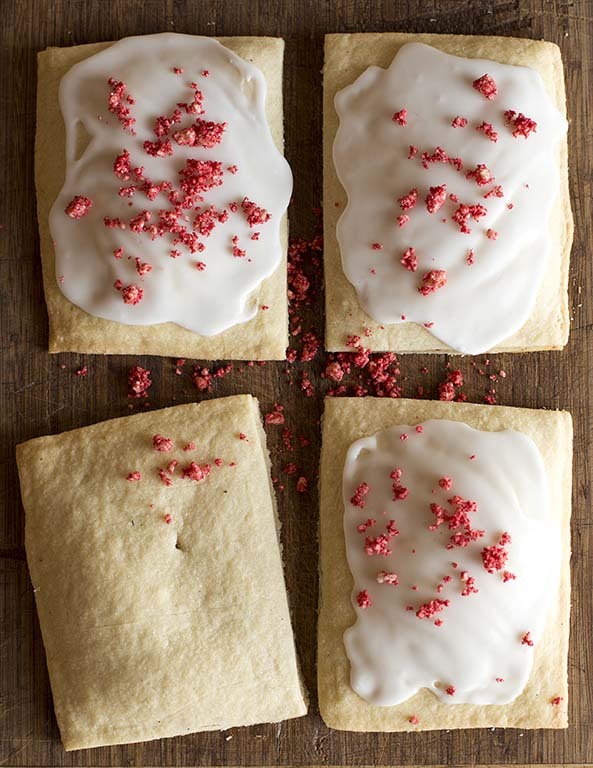 Urgency to experience his cooking — for both regulars and food pilgrims — has never been higher, but luckily his recipes will live on in his forthcoming cookbook, Acorn & Cattail: A Modern Cookbook of Forest, Farm & Field. Click here for recipes from the Curious Kumquat.